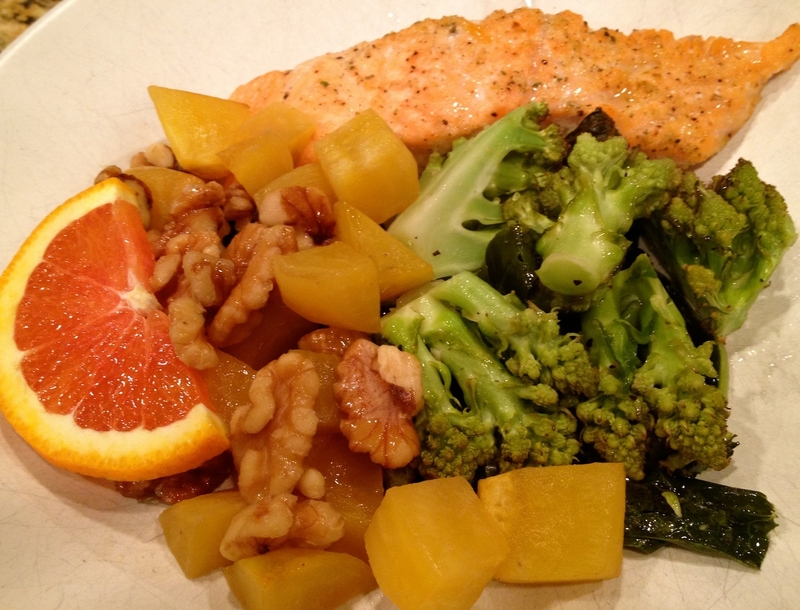 Stir fry preparations are a great way to get sizeable portions of vegetables in a single dish. 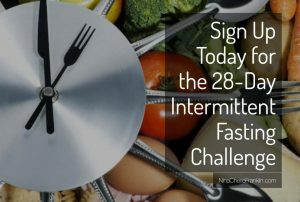 Ingredients like bell pepper, green cabbage, mushroom, onion, carrot, broccoli, garlic, and ginger, are among the tastiest. 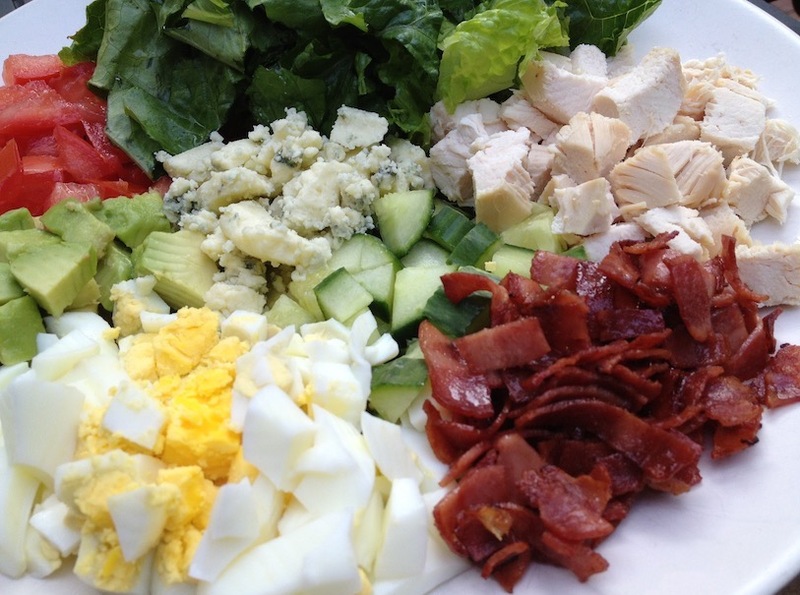 At the start of my weight loss journey I hated eating vegetables and anything else “healthy”. Unsurprisingly so as I was only 14 years old. My mom would cook some of everything to stimulate my appetite for healthy foods but to no avail. Now, she knew I loved Chinese food, especially pepper steak. 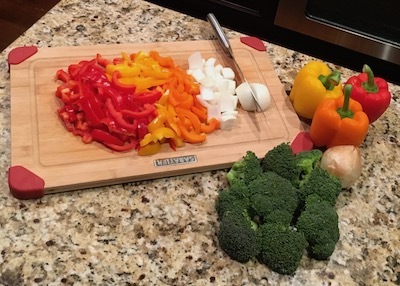 So, one day she whipped up a steak stir fry filled with bell peppers, broccoli and other veggies, served it over a bed of rice, and told me it tasted just like pepper steak. I tasted it and killed it! Since this was the only way I’d eat vegetables, my mom started cooking different stir fry preparations every day. My family didn’t have a lot of money so most of them were made with chicken but occasionally she’d also use shrimp. 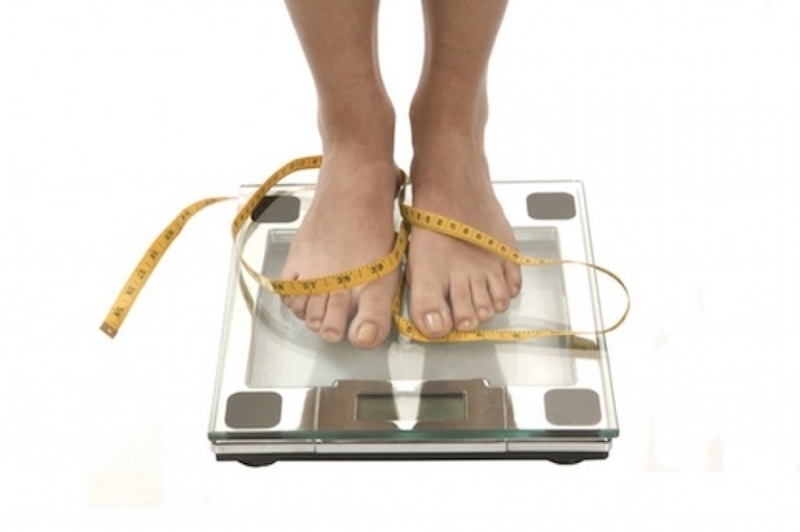 After three months of exercising and living on stir fries, I ultimately lost 65 pounds. And, to this day, shrimp stir fries are one of my favorite meals. Nowadays, I generally prepare them with high-quality extra-virgin olive oil to boost the overall nutritional value of the veggies. 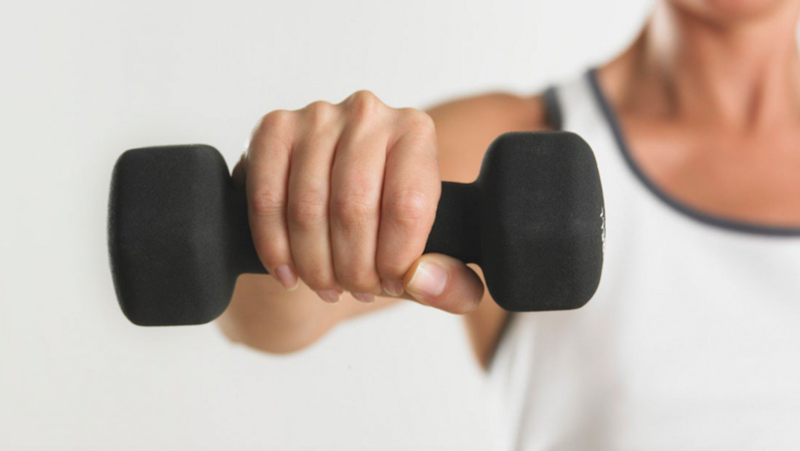 This oil is largely comprised of monounsaturated fat, which enhances absorption of fat-soluble vitamins (A, D, E, and K), most of which vegetables contain. 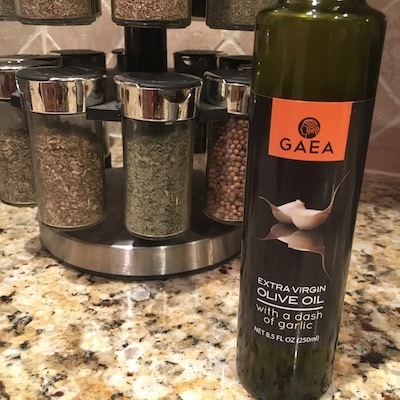 I was recently introduced to Gaea Extra-Virgin Olive Oil with Garlic and decided to use it for one of my favorite shrimp stir fry preparations. It was incredibly awesome! In and of itself, garlic is a super savory spice that can bring almost any dish to life. 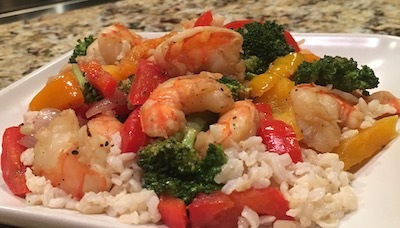 If you’re looking to try something new, take a stab at my “Garlicky Teriyaki Shrimp and Vegetable Stir Fry” recipe and you’ll see exactly what I mean. 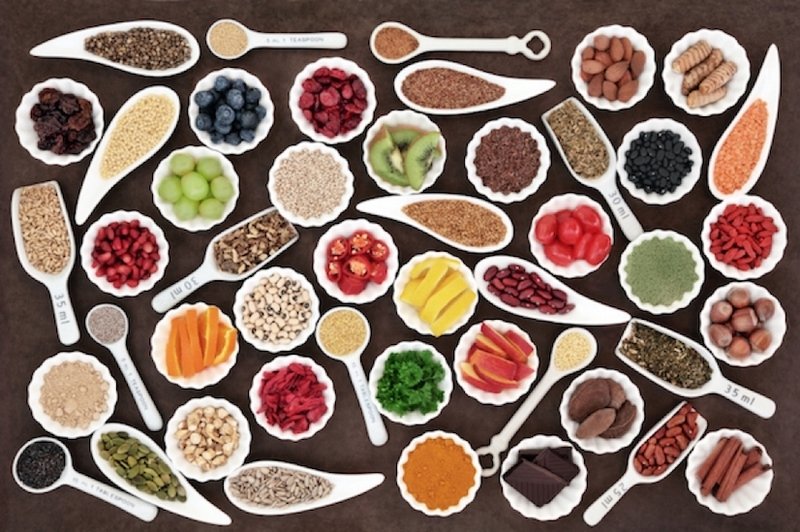 *If you don’t have a spice rack, Mrs. Dash-Original Seasoning Blend makes a great substitute for the dried seasonings. 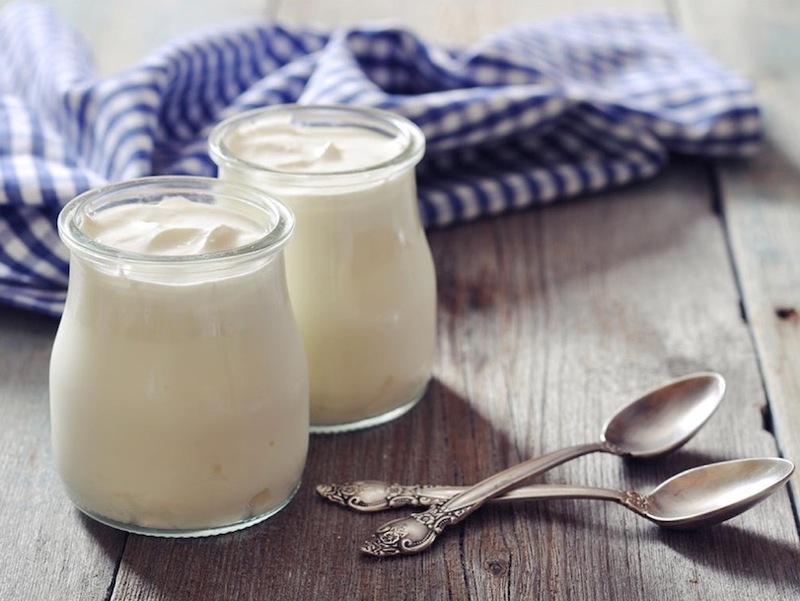 *Cornstarch can be used in place of tapioca flour if you wish. Start by mixing all ingredients for the teriyaki sauce (except for the tapioca flour) in a small saucepan and begin heating the mixture over medium heat. Next, blend the tapioca flour in a cup of cold water until it fully dissolves and then add it to the saucepan. Continue to heat the sauce until it thickens, adding more water to thin it out if you wish. Heat a large wok or skillet over high heat, add a tablespoon of olive oil, and then spin it until the pan is fully coated. Add the shrimp, sprinkle them with Old Bay Seasoning, and stir fry them for 3-4 minutes. Next, add the mushrooms and cook them with the shrimp until they’re fully browned. 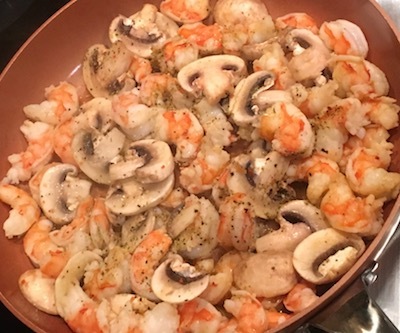 You can then remove the shrimp and mushrooms from the pan and place them aside in a medium bowl. Add another 2 tablespoons of olive oil to the pan and, again, spin it until the pan is fully coated. 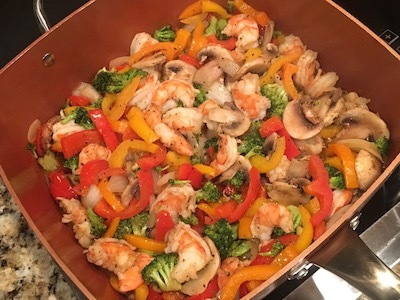 You can then add in all the vegetables, drop in another tablespoon of olive oil, top everything off with the dried seasonings, and then stir fry the mixture for about 1-2 minutes. Stir in the shrimp and mushroom mixture, add the teriyaki sauce (to your desired level), and then bring the fully blended mixture to a boil. 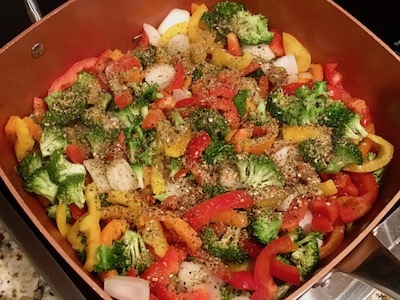 Cook the stir fry blend for an additional few minutes or until all the vegetables are crisp and tender. When you’re ready to eat, scoop out the stir fry blend and serve it over a bed of cooked brown rice (Tip: Cook the brown rice in advance as it generally takes about 34-45 minutes to prepare). 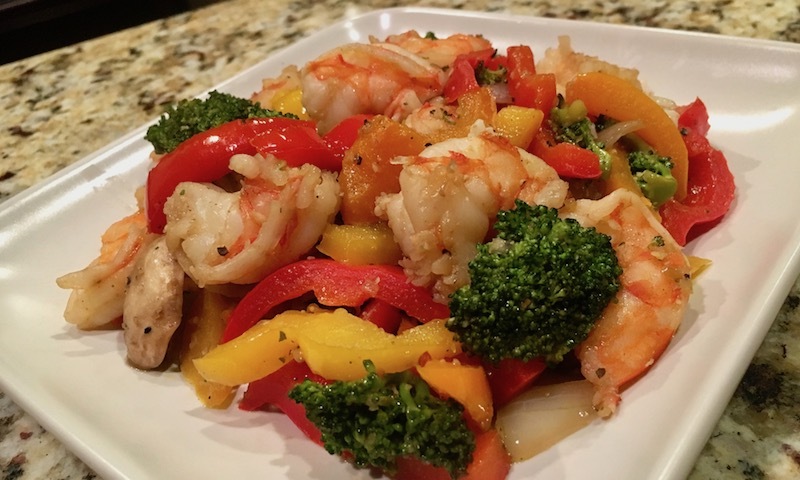 You must try my “Garlicky Teriyaki Shrimp and Vegetable Stir Fry” recipe. 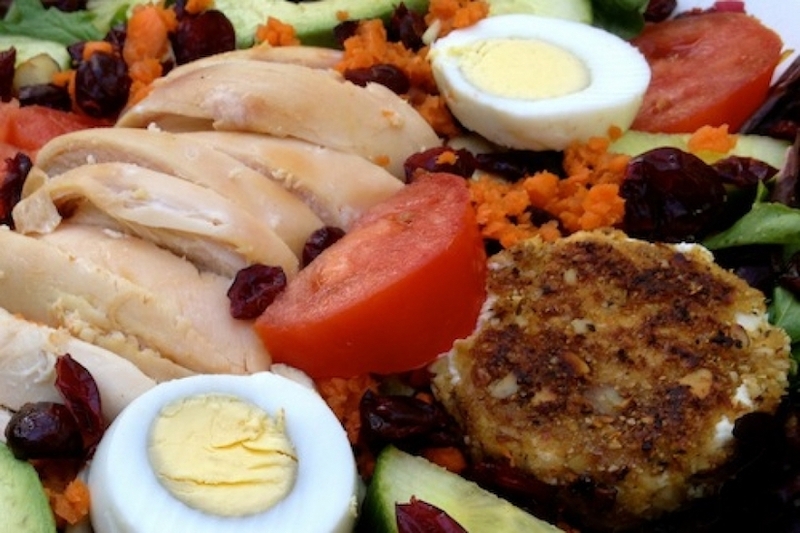 Rich in protein, high-quality carbohydrates and heart-healthy fats, it’s the perfect dish for weight watchers and carb counters alike! 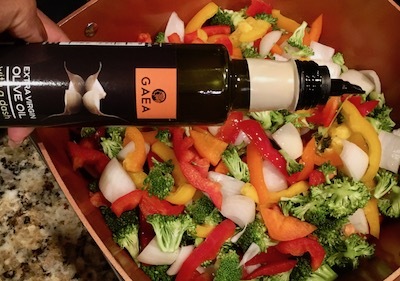 While any brand of extra virgin olive oil will suffice, if you really want to bring out the full flavor your veggies, I highly recommend giving Gaea Extra-Virgin Olive Oil with Garlic a shot. 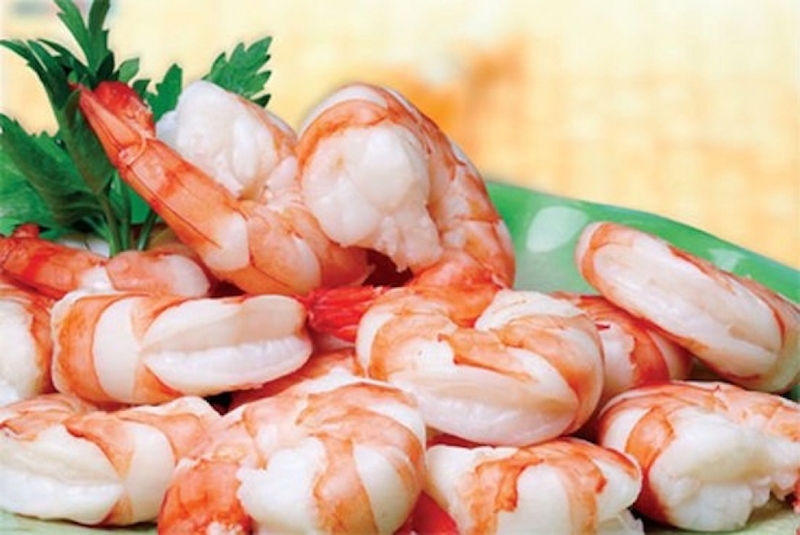 And, although this recipe calls for wild black tiger prawn shrimp, you can easily replace them with your preferred type. 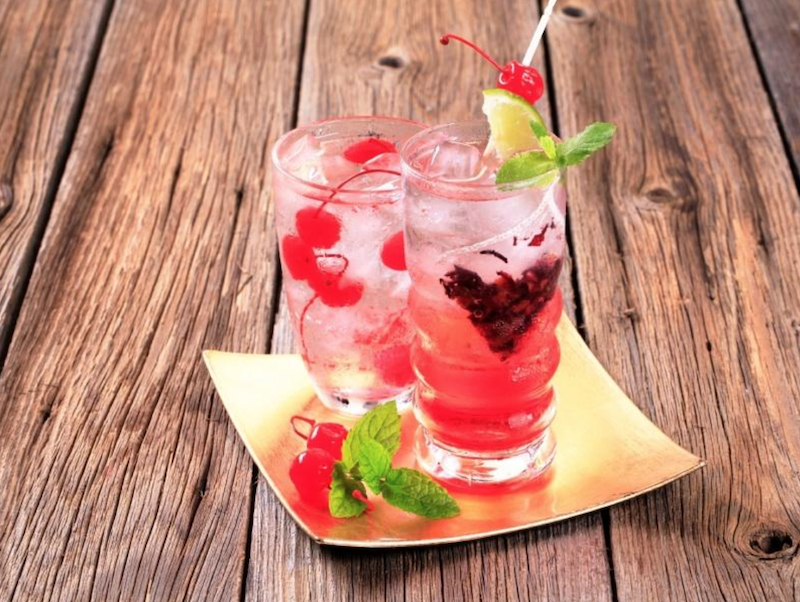 You can also substitute the shrimp for chicken, beef or even your favorite meatless substitute for a vegetarian-friendly blend.